Many household plumbing systems use PEX for pipes to supply hot and cold water. The term PEX stands for “crosslinked polyethylene.” PEX piping is manufactured by melting high-density polyethylene and extruding it in the form of a tube. This material was first introduced to the United States only 40 years ago, but it’s catching on fast. Easy install. PEX pipes are flexible and therefore simpler to install than PVC. Your plumber will have to create fewer connections, because PEX can bend to accommodate changes in direction. What’s the payoff for you? Fewer potential sources of plumbing leaks. The small number of connections still necessary will be made using cold expansion rings or crimp fittings. No need for glue, which can leach into the water with PVC pipes. Compatibility with metal pipes. When a connection to copper or other metal pipes is required, PEX works better than PVC because crosslinked polyethylene won’t corrode. Freeze resistance. It’s resistant to freezing (once again, due to its flexibility, which allows the PEX piping’s diameter to expand as the water pressure changes). In plain English, this means that you’re less likely to end up with burst pipes. Safety. All PEX plumbing pipes must be certified according to ANSI/NSF Standard 61 for drinking water safety, to verify that they are safe for potable water. UV intolerance. PEX cannot tolerate exposure to sunlight, which limits its possible usages. It’s fine for inside your home but if you’re having PEX piping installed outdoors, you will not be able to locate it above ground. PVC (“polyvinyl chloride”), an inexpensive type of thermoplastic, is commonly used for household drain, waste or vent (DWV) piping. CPVC, “chlorinated polyvinyl chloride,” is a product made from chlorinated PVC resin; it's used for hot and cold water distribution, similarly to PEX. Long life. PVC has a predicted lifespan of 50-70 years or more, compared with 40-50 years for PEX. Outdoor safety. PVC is fine to use outdoors, even above ground – you just need to cover the exterior of PVC piping with a coat of water-based paint. Eco-friendliness. Unlike PEX, old PVC piping is accepted for recycling once its useful life is done. Higher leak risk. Rigid PVC pipe means that every connection will require an elbow. This opens up greater possibilities for plumbing leaks. You’ll also run the risk of cracked pipes if PVC freezes. Temperature limitations. Because the ASTM does not approve PVC plumbing pipe above 140 degrees Fahrenheit, it can only be used for DWV piping. For applications involving hot water (bathroom or kitchen sinks, showers, etc. ), you must install CPVC, which is safe to 200 degrees F.
Copper pipes are a longtime favorite for domestic plumbing, with the pluses of strength, ability to handle high temperatures, and suitability for outdoor use. A downside: copper plumbing pipes can develop pinhole leaks or corrosion buildup. Also, not all plumbers have the know-how or willingness to work with copper. The most disturbing problem is that science has linked ingestion of copper through drinking water or other sources to Alzheimer’s disease. 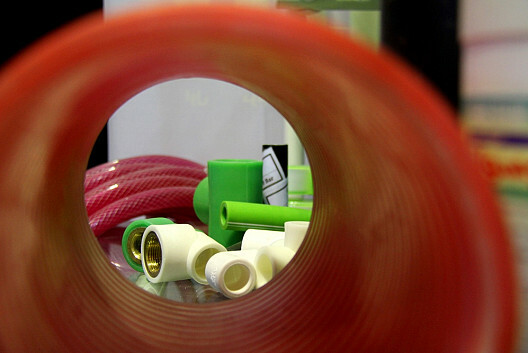 For more information about plastic plumbing pipes, visit the Plastics Pipe Institute website.